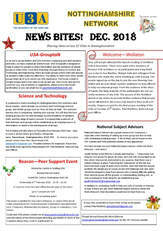 To read the December 2018 News Bites click the image. ​Please forward items for News Bites to lynne.jaremczenko@ntlworld.com by the 15th of every month. To read the November 2018 News Bites click the image. ​​We are pleased to announce that the U3A is coming to Wollaton and District on Tuesday 27th November 2018 at 10.00am at St. Leonard’s Community Centre, Bramcote Lane, Wollaton, NG8 2ND. ​​The launch meeting went very well with around 140 people turning up and ten people volunteering to join a Steering Committee. The first meeting of the new Wollaton U3A will be at 10am on Tuesday January 22nd at the St Leonard's Centre in Wollaton. To read the October 2018 News Bites click the image. ​On 14th September a “Golden Generation 50+ Fair” was held at Blidworth, Nottinghamshire, organised by Mark Spencer, Member of Parliament for Sherwood. The photograph shows Pam Berry, chairman of Rainworth & District U3A and Mark Spencer. U3A members from Rainworth and Ravenshead U3As were present to answer questions from visitors. Click image to enlarge. 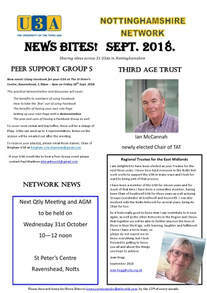 To read the September 2018 News Bites click the image. There was no August issue. 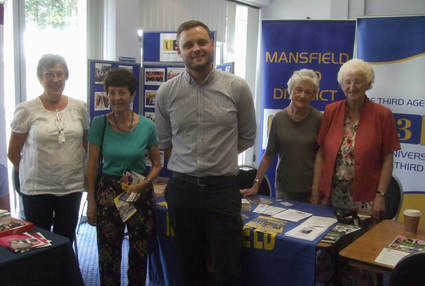 Mansfield and District U3A, together with Forest Town U3A, took part in the first Mature and Senior Citizens' Fair organised by local MP Ben Bradley (Conservative) for his constituents. Five volunteers manned (and 'womanned') the stall during the morning of Friday 13 July. 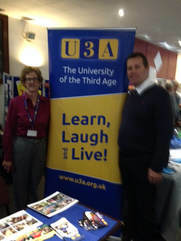 The positive nature of the U3A message brought a number of people to the stall and one has already attended the monthly meeting as a guest a mere four days later. The photograph taken by Michael Allen (Mansfield U3A) shows the volunteers with Ben Bradley. 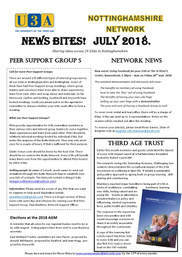 To read the July 2018 News Bites click the image: There is no June issue, if you have any items for August please contact the editor. 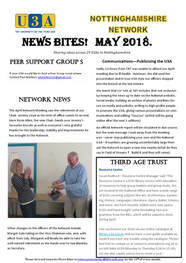 To read the May 2018 News Bites click below: There is no June issue, if you have any items for July please contact the editor. 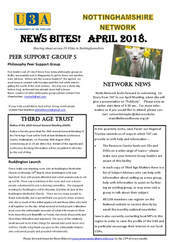 Read about the April network Meeting and the Third Age Trust Resource Centre. Regional Trustee Jane Pavier presented the Certificate of Membership of the Third Age Trust to Warsop & District U3A, Nottinghamshire on 9th April 2018. 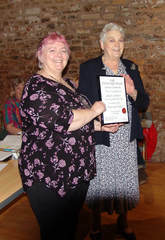 Pictured receiving the certificate is Zena Inger, the chair. 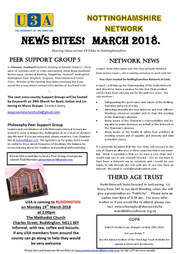 Read about the Philosophy Peer Support Group meeting, the Ruddington U3A launch and news from the Third Age Trust. 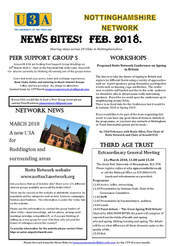 Read about Peer Support Groups, New U3A in Ruddington, Network and Third Age Trust news. 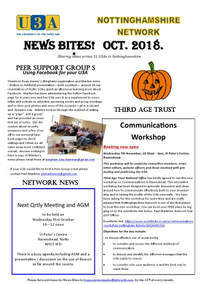 Read about Peer Support Groups, Workshops, a new U3A for Ruddington, the Notts Network Website and the Third Age Trust EGM. 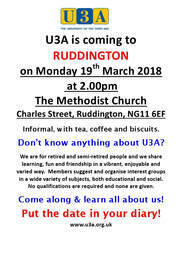 The launch of a new U3A in Ruddington is planned for Monday 19th March 2018 at 2.00pm in the Methodist Church. Full information on the Ruddington webpage. Follow this link for the news archive 2017. Follow this link for the news archive 2016. Follow this link for the news archive 2015. Follow this link for the news archive 2014. Follow this link for the news archive 2013. Follow this link for the news archive 2012. Follow this link for the news archive 2011. Follow this link for the log of all site updates.